1/1 Magic 8-ball says you're not cursed. Not a whiff of magic on you anywhere. Maybe talk to Jennie/Arthur/Dom about lucksnaps? Can you bring me ginger ale and salty crackers? I'll give you a million dollars. Instagram Crosspost - Birthday Macaroons! 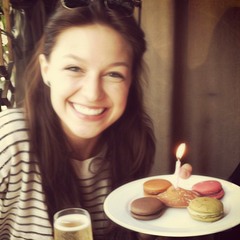 So my birthday was yesterday buuuut...Thank you guys for the birthday macaroons! I'm home from Alaska. Nobody died. I'll be in my room. Hey Wademan! Have you been feeding Daisy extra trees? She's looking kinda fat. Also, I'm gonna go on my first REAL mission with SHIELD and Clint and Kyle and Topaz and Clint's friend! So Clint invited me and Kyle on a mission to Alaska. Some people are missing, including his old partner but they don't know what's going on. Since you can sense people I was thinking maybe you might be able to help? Do you wanna come? x-minibruiser.livejournal.com - Instagram Crosspost - Birthday Macaroons!